The following are some frequently asked questions about refugee claimants arriving from the US. For more information and links about the Safe Third Country Agreement, see also this page. Why are there more people crossing from US into Canada to make refugee claims? More people are arriving both because refugees feel unsafe in the US, and because there are more refugees around the world. Some people in the US without permanent status feel unsafe because of the anti-refugee and anti-Muslim measures adopted by the new administration. They may feel that their refugee claim will not be given fair consideration given the current climate. Some people from one of the seven countries targeted by the “travel ban” are worried that they will not be able to reunite with immediate family members even if they themselves are accepted as refugees in the US. Some people crossing from the US to Canada were simply transiting through the US, and always intended to come to Canada. 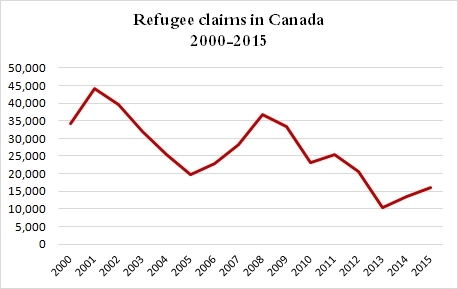 With increasing number of refugees worldwide, we should expect that more refugees will find their way to Canada. The number of claimants had been increasing even before the election of Trump. For example, there have been increasing numbers of people fleeing the violence in Burundi arriving at Canada’s borders: most of them probably always had Canada as their destination. There are over 21 million refugees around the world. According to the UN, we are witnessing the highest numbers of displaced people ever. Only a tiny percentage of these refugees make their way to Canada. Canadians are noticing a recent increase in the number of claimants arriving, but this is only an increase compared to the unusually low numbers of claims in the past few years. In fact we are could say we are returning to more usual numbers. Why do people cross irregularly? People seeking safety in Canada cross the border irregularly in order to avoid being sent back to the US under the Safe Third Country Agreement, which closes Canada’s door to most refugee claimants at the border with the US. The Safe Third Country Agreement only applies to people who make a refugee claim at a Port of Entry on the US-Canada border. It does not apply to people who have entered from the US and subsequently make a refugee claim. Even if Canadian border officials come upon the person right at the border, the Agreement does not apply if they are not at a Port of Entry. Refugees entering irregularly generally present themselves as soon as they can to law enforcement officials, so that they can make their claim. They are not trying to avoid examination – they are just trying to avoid being sent back to the US. Unfortunately sometimes these irregular crossings lead to hardship and tragedy, as in the case of the two men who recently lost their fingers to frostbite. When the agreement was signed, the Canadian government knew that it would lead to increased irregular crossings and potential physical danger for refugee claimants. The government can solve this problem by withdrawing from the Agreement: this would mean that people can once again make their refugee claims in an orderly way at a Port of Entry, which would be safer for everyone. What is the Safe Third Country Agreement? Under the Safe Third Country Agreement, in force since December 2004, Canada and the US designate each other as “safe” for refugees and establish the principle that refugee claimants should generally seek protection in the first of the two countries that they reach. There are some limited exceptions to this principle, including for people with family in the other country. The Safe Third Country Agreement means that if a person makes a refugee claim at a Canadian Port of Entry on the US-Canada border, they will be sent back to the US to claim there, unless they meet one of the limited exceptions in the Agreement. ​Why is the US not safe for refugees? President Trump has adopted arbitrary enforcement, anti-refugee and anti-Muslim measures which mean that we cannot be confident that refugees sent back to the US will have their basic rights protected. President Trump has signed several Executive Orders that affect those seeking refugee protection in the US. In addition to the Executive Order instituting the “travel ban”, two other Executive Orders introduce new immigration enforcement measures. Harvard Law School has published an analysis: “The Impact of President Trump’s Executive Orders on Asylum Seekers”. Expanded “expedited removal” (more people will be subject to summary proceedings that often unfairly deny access to the refugee protection system). Increased arbitrary enforcement in the context of anti-refugee and anti-Muslim government policies. The Safe Third Country Agreement is based on the premise that the US is safe for refugees. When Canada sends refugee claimants back to the US under the Safe Third Country Agreement, we are relying on the US to respect their fundamental rights. If the US fails to do so and sends them back to face persecution, Canada is also responsible for violating their rights. For this reason, Canada must not return refugee claimants to the US unless we are absolutely sure that the US will not send them back to persecution. It is impossible to have that confidence in the current context. The CCR believes that the US has never been safe for all refugees. Because of US laws and how they are implemented, some refugees who receive protection in Canada are denied refugee status in the US. In 2007, the Federal Court agreed with the CCR, ruling that the US does not always protect refugees as required under international law. The situation now is significantly worse. Why do you say people are crossing “irregularly”, rather than “illegally”? It is not illegal for refugees to cross the border in this way. International and Canadian law protect the right of refugees to flee to safety, including if necessary by entering a country in violation of immigration laws. This is based on the fundamental right, as expressed in the Universal Declaration of Human Rights, to seek asylum from persecution in other countries (Art. 14). The United Nations Refugee Convention and Canada’s Immigration and Refugee Protection Act both say that refugees must not be penalized for breaking immigration laws in order to enter the country and seek asylum. What happens to refugee claimants who cross irregularly? Many refugee claimants who cross irregularly must make their claim inland, which means that they spend several weeks without access to government services, including health care. Since changes to the Canadian refugee determination system introduced in December 2012, people who make their claim from within Canada (rather than at a border point) cannot begin the refugee claim process until they have filled in several detailed forms, including the Basis of Claim form. They then need to get an appointment from Immigration, Refugees and Citizenship Canada to make the claim. This process takes weeks, if not months. During that time claimants have no documents identifying them as refugee claimants, no Interim Federal Health (IFH) coverage and no access to social assistance (although policies may vary across the country). If the Safe Third Country Agreement were suspended, people could make their refugee claim at the border ports of entry and would then enter Canada with documentation giving them access to relevant basic services. This would reduce hardship for the individuals and the pressures on communities seeking to respond to their needs. What are the security concerns when refugee claimants cross irregularly? People crossing irregularly may be at physical risk, especially in the extreme cold, as we have seen in the tragic case of the men who lost fingers to frostbite. Smugglers take advantage of people’s desperation, sometimes charging thousands of dollars to take refugees across the border. If the Safe Third Country Agreement were suspended, people could make their refugee claim at the border ports of entry in a safe and orderly way. Canadians have nothing to fear from refugee claimants crossing irregularly. They present themselves as soon as they can to law enforcement officials, so that they can make their claim, and go through a security screening. Refugee claimants are not trying to avoid examination – they are just trying to avoid being sent back to the US. ​If the Safe Third Country Agreement were suspended, would there be a significant increase in claimants coming to Canada? If the Safe Third Country Agreement were suspended, people currently crossing irregularly would instead present themselves at a border point. People are desperate enough that they are coming whether the Agreement is in force or not. Others might also claim, but there is no reason to think that numbers would be unmanageable as a refugee claim in Canada is a viable option for only a minority of people. Canada has received much higher numbers of claimants in the past. While there are large numbers of undocumented people living in the US, only those who have a well-founded fear of persecution in their country of origin could benefit by making a refugee claim in Canada. Those who do not face persecution would be likely to face removal to their home country shortly after arriving in Canada, as their claim would be quickly rejected. A high percentage of asylum seekers in the US are in detention and thus unable to travel to the Canadian border. From 1999 to 2004, there were on average 11,250 refugee claims made each year at the border with the US. In 2016, there were 7,000. ​The US courts have suspended the Executive Order instituting the “travel ban”: does this mean that refugees are safe in the US? The “travel ban” Executive Order is not the only measure of concern. Two other Executive Orders signed on January 25 introduce immigration enforcement measures that significantly increase the chances that refugees will be sent back to persecution from the US. For more information about the two Executive Orders (“Enhancing Public Safety in the Interior of the United States” and “Border Security and Immigration Enforcement), see the Harvard Law School analysis, “The Impact of President Trump’s Executive Orders on Asylum Seekers”. You can support local organizations who work with refugee claimants. These organizations receive little or no government funding and are working hard to meet the needs of refugee claimants, many of whom have arrived via the US. What if a person has made a claim in the US (and been rejected)? Whether a person has or has not made a refugee claim in the US has no relevance under the Safe Third Country Agreement. There could be some relevance when the refugee claim is being heard. In determining whether a person is a refugee, the Immigration and Refugee Board will take into account information about prior claims in other countries, or the fact that no claim was made. The information will be weighed alongside all other relevant information about whether the person is a refugee. ​Can people flee to Canada on basis of discrimination in the US? People who make a refugee claim in Canada must show that they have a well-founded fear of persecution in their country of origin. There is no basis in Canadian immigration law for a citizen of a third country to ask Canada to protect them from discrimination in the US. What services and government programs are refugee claimants entitled to? Refugee claimants are entitled to very little. Depending on the province, they may be entitled to legal aid to help them present their refugee claim. Once they have been found eligible to make a refugee claim they receive access to the Interim Federal Health Program. They can apply for a work permit, unless they are from a Designated Country of Origin (although it takes months to receive it). Those who have no other means to support themselves can apply to the province for social assistance while waiting for a work permit. Refugee claimants are not eligible for federally funded settlement services. Some provinces fund limited services for refugee claimants. For more information, see CCR, Keeping the door open: NGOs and the new refugee claim process, Oct 2014. What is the difference between “refugee”, “refugee claimant” and “asylum seeker”? According to the UN Refugee Convention, a refugee is a person with a well-founded fear of persecution on the basis of their race, religion, nationality, membership of a particular social group or political opinion. A refugee claimant is the term used in Canada for a person who has made a refugee claim. They may or may not be a refugee. The refuge determination process exists to decide this question. An asylum seeker is a person who has left their country and is looking for refugee protection (also known as “asylum”). Again, they may or may not be a refugee. In some countries, including the US, “asylum seeker” is the term used for what in Canada we call “refugee claimant”, i.e. someone who is in the refugee claim determination process. What is the difference between refugee resettlement (e.g. the Syrians resettled to Canada) and the refugee claim process? Refugees come to Canada in two ways: through resettlement or by making a refugee claim in Canada. Refugees who are resettled are determined to be refugees by the Canadian government while they are still outside Canada in a third country. They undergo immigration processing before travelling to Canada and become permanent residents as soon as they arrive. They are supported in their settlement in Canada for the first year by either the government (Government Assisted Refugees) or by private sponsors (Privately Sponsored Refugees). Resettlement is a discretionary action taken by Canada on a humanitarian basis. Refugee claimants ask for Canada’s protection at the Canadian border or from within Canada. Their refugee claim (if found eligible) is heard by the Immigration and Refugee Board. If they are found to be a refugee they can apply for permanent residence. Canada has legal obligations towards refugee claimants: the most fundamental principle of international refugee law is non-refoulement, meaning that Canada must not send refugees back to persecution. This international legal obligation is reinforced by obligations under the Canadian Charter of Rights and Freedoms, especially section 7 (the right to life, liberty and security of the person).